This custom keyring project took us – and our client – by surprise! The Russell Hotel is a boutique hotel in the heart of the Rocks, Sydney. Quite by chance, it was featured in Episode 12 of a Japanese anime: Free! Eternal Summer. The series aired in Japan in 2014. 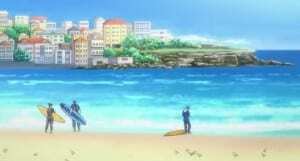 In Episode 12, two of the main characters, Rin and Haru, visit Sydney. 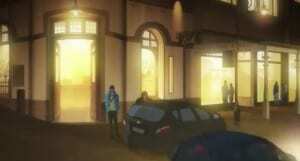 It was the first time the anime featured locations outside Japan. It includes beautiful and accurate images of Sydney landmarks. The Harbour Bridge, Bondi Beach and – wait for it – the Russell Hotel! The two boys check into the Russell Hotel and are given the key to Room 25. It’s a custom keyring – each room at the hotel has its own custom keyring – and the anime shows Rin tossing the key in his hand. The hotel couldn’t keep up with demand. That’s Ilga of the Hornet Group, of course. 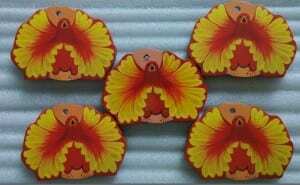 While the original keyrings were hand-crafted one by one in Australia, Ilga was able to find a supplier in China who can deliver in bulk. So now, all the ‘Free! Eternal Summer‘ fans who want a custom keyring like the one in their favourite anime can get one. An animated film, High Speed! – Free! Starting Days, featuring the same characters, will be released on December 5, 2015. We’re not sure whether the keyring’s featured, but if there’s a sudden surge in demand, Hornet can certainly arrange for more stock! The complete Episode 12 of Free! Eternal Summer is available here. English subtitles. The key comes at around 13 minutes. When Haru and Rin are checking in, you can see all the different custom keyrings for the different rooms on the wall behind the receptionist.